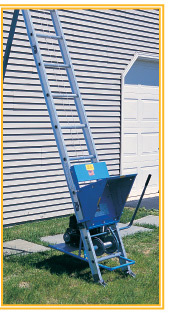 Our Roofing (or Shingle) Hoist is a sectional 27' elevator unit that is designed to carry materials, such as shingle bundles, up to a rooftop. The base section is 11' long and the two 8' add-on sections easily bolt together at the jobsite to reach a full 27' in height while still being compact enough for easy transport. The power unit is attached to the base section and is powered by a powerful electric motor. The unit is fitted with a cable safety brake and can be used to ease down loads as well as power them up. Plywood hooks are also included to keep the plywood sheets from kicking out at the base when the elevator is used to hoist roof decking sheets.